Linen cupboards can be located in various spots in a house. Many are situated at the end of the front hallway or on landings. I don't feel at home unless my linen cupboard is sorted. Whenever I move house, it's the first thing I arrange. It also means a pretty tablecloth is ready to use if people suddenly pop over. You may not have time to polish a table, but you can always throw a tablecloth over it. 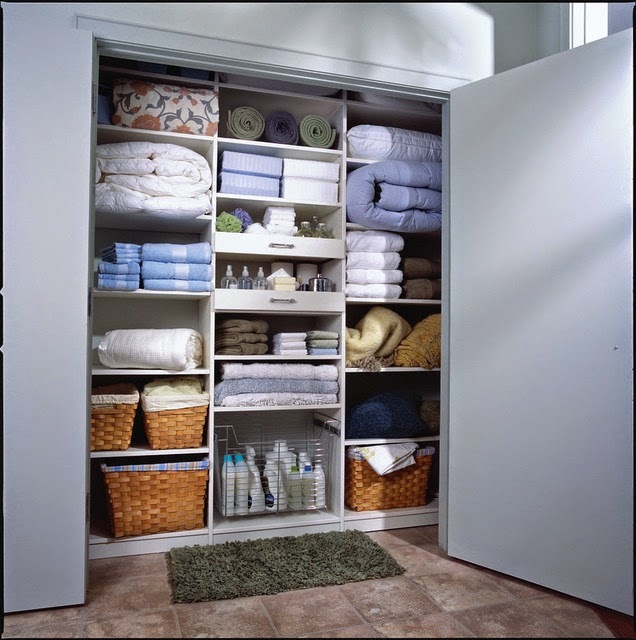 The linen cupboard should be sorted by having items most used at eye level, those least used on higher levels and items for children, such as towels, on lower levels. Make sure there's nothing dangerous on the lower, child-accessible levels. Speed your cleaning by storing linen according to the room it's used in. That way, when you're cleaning a particular room, you can easily grab one pile of linen rather than sorting through several shelves. If you only have a limited amount of storage space, have the linen piled from bottom to top, but group it according to the room it's used in. If you have items stored for a long time, wrap them in acid-free tissue paper to stop them from going yellow. Acid-free tissue paper is available from newsagents, art supply stores, picture framers and sometimes from dry cleaners. Quick tip: If an item has gone yellow, it's generally because of soap residue. To repair cotton items, soak them in Napisan. For sil, hand wash in 1/4 cup of lemon juice added to a nappy-sized bucket of blood-heat water, then dry in the sun. For vintage items, use 2 teaspoons of soap flakes, 1/4 cup of white vinegar added to a bucket of blood-heat water, rinse then dry. Bugs love linen, so keep bath salts and fragrant soaps in the linen cupboard to deter them. The salts and soaps will leave a lovely scent on your linen. Also use scented paper liners on the shelves, which you can make yourself. Never store medicine in this cupboard because the linen will absorb the smell. Even Band-Aids have an odour that will be absorbed by the linen. Cleaning the linen press is a spring/autumn cleaning job. Remove all the linen, then vacuum the shelves of the linen press. Shake each item and refold before returning it to its spot in the linen press.